Blockchain, the technology underlying Bitcoin, could be used to run anything from a protest movement to a nation – promising an impartial and networked democracy suited to 21st-century life. It's an exciting prospect, but can it actually work? Even if your interest in global politics extends no further than an occasional worried glance at the headlines, it will not have escaped your notice that there's something in the air these past few years: a kind of comprehensive, worldwide souring of the possibilities of representative democracy. You might not have thought of it in just these terms, but you'll certainly recognise its effects: it has shown up in phenomena as varied and seemingly disconnected as the Brexit referendum, the candidacy of Donald Trump in the USA and the turn toward authoritarian parties and governments in France, Turkey, Hungary, the Philippines and elsewhere. This is, perhaps, the pre-eminent political story of our time. What all of these more recent developments have in common is the sense among a wide swath of the electorate, in country after country, that the conventional practice of democracy has failed them. It no longer expresses the will of the people, if it ever did, and now serves only the needs of distant, shadowy, unspecified elites. And as is so often the case, there is a grain of truth to this. Our democracies certainly do seem to be having a hard time reckoning with many profound crises, whether these involve the integration of refugees, the disappearance of work or the threats of climate change. Our existing ways of making collective decisions have conspicuously failed to help us develop policies equal to the scale of crisis. There really is a global 1 per cent, and they seem to be hell-bent on having themselves a new Gilded Age, even as the public services the rest of us depend on are stripped to the bone. Throw in the despair that sets in after many years of imposed austerity and it's no wonder that many people have had enough. Some voters, either impervious to the lessons of history, or certain that whatever comes, they'll wind up on top, seek the clarity and vigour of a strong hand. They are perhaps encouraged by authoritarian leaders abroad, with their own internal reasons for disparaging the practice of democracy and much to gain by undermining confidence in it. Other voters have no particular time for the right, but feel betrayed by the parties they once trusted to advance their class interest. When they look around and see that someone other than them is indeed profiting from the status quo, they lose all patience with the idea that redress can be found in the ballot box. They're willing to see their own house burned down, if that's what it takes to stick it to the despised elites that are suddenly, heedlessly gentrifying their neighbourhoods and 'decanting' them from their homes. These are certainly depressing responses to the situation we find ourselves in, but they're not in any way irrational. Yet there's another, more hopeful and interesting way of responding to this same set of facts. It argues that what we need now is more democracy, not less; and a new kind of democracy at that, one founded on technical means. This curious prospect is presented to us by modes of social organisation and self-governance based on the blockchain, the technology underlying the Bitcoin cryptocurrency. And though blockchain advocates are nowhere near as prominent as the neo-authoritarian tendencies everywhere around us, what they are arguing for – 'distributed consensus' – is so interesting and so utterly unlike anything that has gone before that it deserves our fullest and most serious consideration. We're told that this emerging technology of 'distributed consensus' makes entirely new forms of human association possible; that anyone who wants to will be able to organise themselves into non-hierarchical groups with as much ability to act in the world as any state or corporation. The idea is that governmental structures at just about every level of society would be replaced by voluntary associations represented as software. Participants in these groups could remain anonymous to one another, if desired. But their identities would be verified – and their votes authenticated – by the same processes that secure the Bitcoin network, meaning that a permanent, secure record of every vote ever taken would be available for all to see. As each of these groups would be able to dispose of fiscal resources directly, Porto Alegre-style participatory budgeting could be realised, at whatever scale required. And just like Bitcoin, all of this functionality would be distributed across the network, making it inherently resistant to attempts at state censorship or control. Enthusiasm for distributed consensus is especially marked on the left, and it's easy to understand why: you'd have a hard time intentionally designing language more likely to appeal to tech-savvy horizontalists than 'distributed consensus'. The phrase summons up images of a society organised as a supple network instead of a hierarchy, its far-flung and mobile constituents bound together by a guiding ethos of participation, and an immaterial but powerful calculated technology. Thoughtful veterans of the post-2008 moment could be forgiven for thinking that, just maybe, here at last is a concrete way of achieving ends promised but never quite delivered by 15M, Occupy, Nuit Débout, or what has come to be known as the broader global 'movement of the squares': a commons outside the market and the state, a framework for democratic decision-making truly suited to the context of 21st-century life, and just possibly a functioning anarchy. This is certainly a supremely attractive vision, at least for those of us whose hearts beat a little bit faster at the prospect of ordinary people everywhere taking their fate into their own hands. In fact, there's really only one problem with it: it's all based on a misunderstanding. Let's back up a little. What, exactly, does distributed consensus mean? 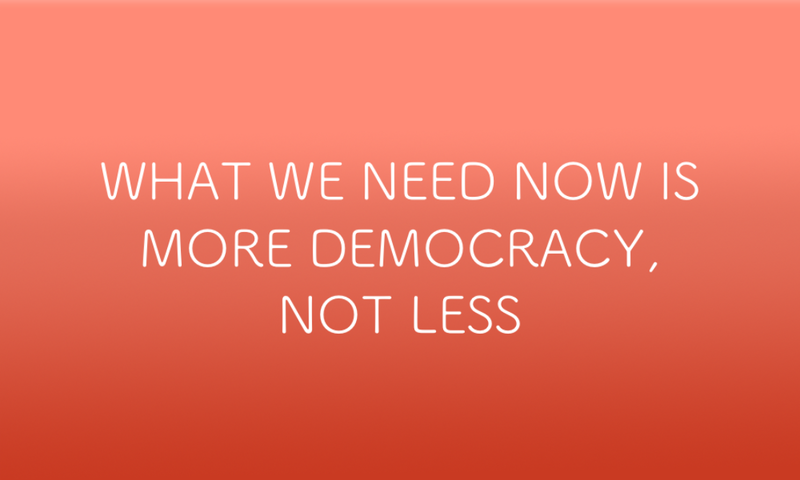 And what does it have to do with the new forms of democracy that might now be available to us? At a time when 'disruption' and 'disintermediation' remain potent words in the tech community, it was inevitable that someone would think to disrupt the way we organise civic life. Early experiments in digital democracy mostly confined themselves to tinkering in the mechanics of an otherwise conventional political process – working out, for example, how verified electronic voting might work. But more recent proposals, such as the "distributed autonomous organisations" pioneered by the Ethereum project, and the structurally similar Backfeed and democracy.earth initiatives, offer far more ambitious ideas of networked citizenship and decision-making. All three are based on the decentralised system of authentication that was originally developed for the Bitcoin cryptocurrency. The details of this mechanism are fiendishly difficult to understand, but its essence – and the innovation that so excites fans of networked democracy – is that it proves the legitimacy of Bitcoin transactions computationally, instead of relying on the authority of any government or banking institution. Everything rests on the blockchain, a permanent, transparent record of every exchange of Bitcoin ever made, an identical copy of which is held locally by every machine participating in the network. The blockchain maintains and reconciles all account balances, and is the sole arbiter in the event of a discrepancy or dispute. Whenever a new transaction appears on the Bitcoin network, all of its nodes perform an elaborate series of calculations aimed at validating it, and a majority of them must agree its legitimacy before it can be added to the shared record. This peer-to-peer process of distributed consensus can be applied beyond cryptocurrency to other situations that require some kind of procedure for the collective construction of truth. One of these is communal decision-making, at every level from household to nation. So by extension distributed consensus could be applied to the practice of democracy. 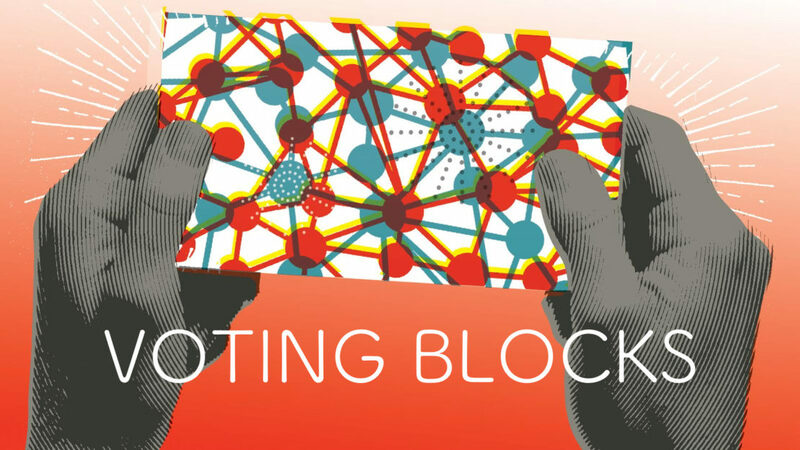 Moreover, frameworks based on the blockchain promise to solve a number of long-standing democratic problems. They give organisers the ability to form associations rapidly and equip them with clear, secure and answerable decision processes. Their provisions allow members of those associations to float proposals, raise points for discussion among their peers, and allow enough time for deliberation before a question is called to a vote. They seem well suited to address some of the limits and frustrations of the Occupy-style forum, chiefly its requirement that everyone sharing an interest be present at once in order to be counted. And by allowing an association to specify any decision rule it pleases – from simple majority to absolute consensus – these frameworks even seem as if they might address the distaste some of us have always harboured for the coercion implicit in any majoritarian process (many don't like the idea that they need to go along with a notion just because 52 per cent of the population voted for it). These systems would appear to be applicable to democracy, then. But more than that, they gesture beyond conventional politics, toward something not far off utopian. When I meet people who are genuinely excited by platforms like democracy.earth, Ethereum and Backfeed, most often what they're responding to is not so much about how these frameworks address the practicalities of small-group decision-making. They're more about the radical, classically anarchist vision they offer of a world in which power is distributed across a federation of nonhierarchical assemblies unsanctioned by any apparatus of state, each one lasting just long enough to enact its participants' will before evaporating for ever. And that's why it's little short of heartbreaking to conclude that their hopes stem from a confusion of language. There's a fair degree of slippage between the way we'd be likely to interpret 'distributed consensus' in a political context, and what the same phrase actually denotes in its proper, technical context. As it turns out, here the word 'consensus' doesn't have anything to do with that sense of common purpose nurtured among a group of people over the course of long and difficult negotiations. Rather, it is technical jargon: it simply refers to the process by which all of the computers participating in the Bitcoin network eventually come to agree that a given transaction is valid. Instead of being a technically mediated process of agreement among peers and equals separated from one another in space and time, it's actually just a reconciliation of calculations being performed by distant machines. To mistake the one for the other is to commit a dangerous error. Why dangerous? One of the primary risks we face in embracing blockchain-based structures is that we may not actually be advancing the set of values we think we are. The provisions that frameworks like Ethereum, Backfeed and democracy.earth are founded on, in particular, are difficult to reconcile with other values and commitments we may hold, especially the notion of a life in common. An Ethereum distributed autonomous organisation, for example, requires that members buy shares in it in order to participate. This is necessitated by the reward structure that incentivises machines to perform the calculations that establish distributed consensus; but it seems curiously at odds with our understanding of political participation as an inalienable right. Ethereum democracies, too, have something most others do not: owners, someone empowered to add or remove voting members at will, set its binding decision rules, and change those rules whenever they desire. "In general, a human organisation can be defined as combination of two things: a set of property, and a protocol for a set of individuals, which may or may not be divided into certain classes with different conditions for entering or leaving the set, to interact with each other including rules for under what circumstances the individuals may use certain parts of the property." On closer inspection, this doesn't seem to have much to do with the practice of collective self-determination. And with a similar emphasis on property rights, the discourse around the blockchain also routinely treats as uncontroversial statements which are no such thing. The acceptance of these values runs so deep that when democracy.earth announced itself "a Y Combinator-backed organisation", nobody involved evidently wondered whether something which aspired to be a radical new way of doing politics should tout its backing by a venture-capital seed fund based in Silicon Valley. 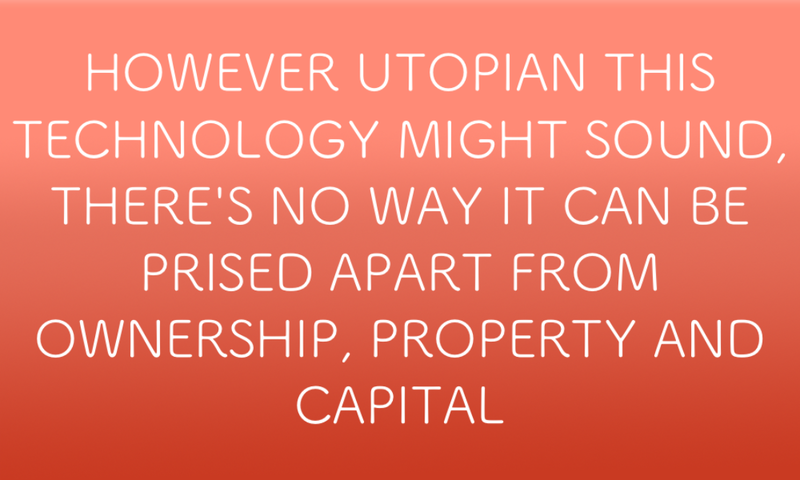 However utopian a politics of distributed consensus might sound to us, then, there's no way in which it can be prised apart from the entirely conventional constructions of ownership, private property and capital accumulation at its very heart, at least not in its present form. The profoundly murky quality of blockchain technology – and the relative lack of accessible but technically sophisticated resources that might explain it – thus causes some of us to endorse a set of propositions we'd otherwise recoil from. We criticise lack of government transparency, yet the blockchain is unfathomable to most people. Finally, too many of those touting distributed democracy retain a weirdly naive faith in the promises made about the blockchain's ability to transcend human fallibility, despite the well-known history of Bitcoin hacks, thefts and exploits. The founders of democracy.earth, for example, would have us believe that the blockchain is 'incorruptible', when, as all long-time observers of the cryptocurrency scene know, it's anything but. There is no better case in point than Ethereum's own networked democracy, a distributed venture fund rather confusingly called the DAO – Decentralised Autonomous Organisation – which was notoriously drained of a full third of its value by someone who evidently understood its coding better than its own originators. The Ethereum blockchain was subsequently 'hard forked' to undo this exploit, but only at the cost of angering that passionate fraction of their community convinced that distributed calculation could achieve what millennia of human law and custom had not. Though they may someday be robust enough to undergird decisions of genuine import, the experience of the DAO suggests that blockchain-based protocols are at present no more trustworthy than any of the less glamorous methods for assessing communal sentiment we already have at our disposal: the assembly, the discussion and the poll. There's a long list of benefits that might follow from shifting civic life on to a networked platform. 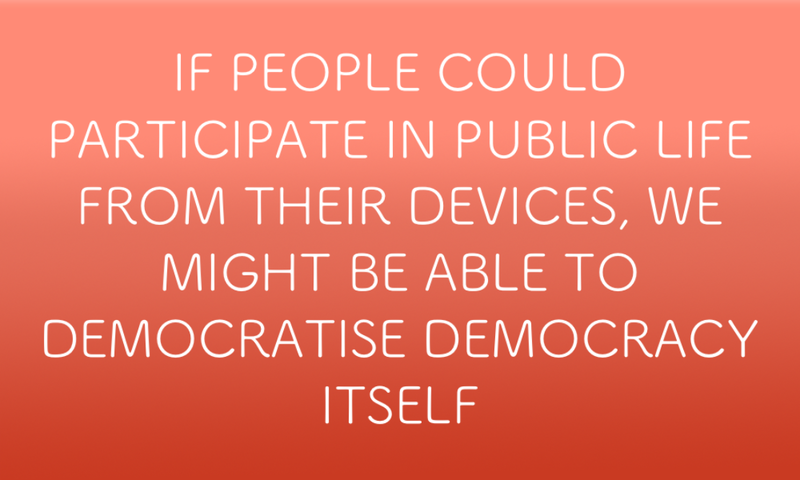 If people could participate in public life from their laptop (or smartphone, or gaming platform), we might be able to democratise democracy itself, in all sorts of salutary ways. We might fold in all those who, by dint of their work, childcare or family obligations, are too exhausted or pressed for time to attend a decision-making assembly, and prevent the common circumstance in which such an assembly is captured by a bad-faith participant with an axe to grind. We could avoid having to gather stakeholders in a given place and time to make decisions of common import, and allow people to participate in public life as and when they were able to. And we could apply to that participation all the tools that arise from being networked and digital, particularly the ability to capture and analyse detailed data about a matter up for discussion. Under such circumstances, decisions could be compared between polities and jurisdictions, or with ones made locally in the past, and every aspect of a community's process of self-determination could be searchable, so available to all who might benefit. Over time, we might even learn to make wiser decisions, individually and collectively. Though the devil is always in the detail of implementation, these possibilities are all well worth exploring; and taken together they certainly furnish us with a strong case for networked democracy. But there are problems even with such relatively simple articulations of civic technology. Not everyone owns a smartphone, even now, let alone any more expensive networked devices. Just over 60 per cent of North Americans do, which falls far short of the universal access on which any system for networked democracy would need to be based. And technologists and advocates for new technology are often blind to the digital divide, which prevents measures that seem utterly obvious and self-evident to them from being at all suited to the lives of others. But maybe these are errors we can learn from. It's worth asking if some of the things the blockchain-based frameworks promise to do for us might be lifted whole out of the matrix of their origins. They get a lot of things very right, after all – particularly their understanding that democracy is an ongoing process, and not something that happens in a voting booth on one day every four or five years. And by framing the practice of active citizenship as something appropriate to every scale of collective existence, they suggest that such participation should occupy a larger place in our civic lives; that we can and should assume control over a wider range of the circumstances of our being. By the same token, democratic practice is a subtle thing. It is possible to do a great deal of damage by applying it without due regard for its strengths and limitations – witness Brexit. So perhaps the most important thing we might seek to gain from our encounter with tools like Backfeed and democracy.earth is a lesson in what works at what scale and what doesn't. We could then design a generation of distributed collective decision processes that are straightforward enough to be understood by the people using them, and not beholden to profoundly interested notions of private advantage. Developing an infrastructure built from the ground up would be a great way of redeeming the hope that's already been invested in these systems, and it might even convince those who have become disillusioned with democracy that there's more life in the concept yet. Maybe it's time we got started. Will the titans of the sharing economy meet their match?